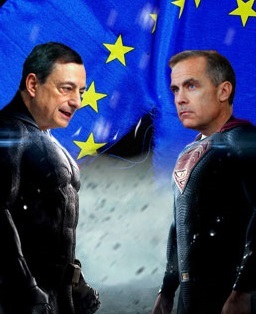 Super Thursday has all eyes set on Draghi and Carney’s speech scheduled for midday. The UK economy continues to expand despite the public’s choice to leave the European Union. Perhaps, Theresa May’s hard stance about Brexit will make ‘Britain Great Again,’ no one knows yet! Things seem to be taking a wrong turn across the pond as Donald Trump’s pledge to make ‘America Great Again’ seems to be a statement clouded in doubt. 2017 is far from being a quiet year; we could almost call it ‘Super 2017.’ There’s so much happening…. Trump has tweeted this, Theresa May should have done that and ultimately, we have an unhappy Queen! What tactic will Carney and Draghi adopt today? The FX market is undoubtedly prey to the massive economic and political changes we are currently witnessing. Despite the name ‘Super Thursday’ is widely expected to continue the flat trend seen from the world’s central banks this week. Interest rates or asset purchases from the BoE are not expected to change on ‘Super Thursday.’ Carney’s speech will be focussed on the rise in inflation. Also, the BoE will not announce any monetary policy changes. But we must keep in mind that Carney does not have a clear picture of Theresa May’s plans of taking Britain out of the EU’s single market, so he is not able to provide a clearer breakdown of things that will affect the UK’s economy. Financial markets are hoping for a rate hike by the BoE, but analysts claim that it will not happen until mid-2019. So, what will this mean for the Pound, will it pop its nose against its majors? Again, the picture remains unclear. In addition, ECB President Mario Draghi is due to give a speech in Slovenia at 1215 GMT, highlighting a new opportunity for reflection on the macro trend. Market participants will be closely scrutinising any comments surrounding his inflation expectations and any indication of more hawkishness from the central bank’s president could further boost the single currency. Efx News gathered what major banks think will happen on Super Thursday. Read more on eFX NEWS! It will be interesting to see how ‘Super Thursday’ unfolds. Our traders are your eyes and ears in the markets, so call us today on 020 7856 2467 to discuss any FX transactions you may have queued up. Our professional traders will assist you to hedge your risk and protect your businesses bottom-line. Don’t have an account with us? Register for free now!